Note that launch parties aren't limited to the release date! Feel free to plan a launch party for the week after or even a month after! openSUSE 11.3 Launch party and Installfest. When: Saturday, 17th July 2010, 5 pm. openSUSE 11.3 Talks/Launch party/Install Fest. When: Probably on 25th July, 2010, afternoon. openSUSE 11.3 Launch Event and Live Demo of features. When: Probably on 28th July, 2010, afternoon. When : Sunday, July 25th 2010, 09:00 AM. Where : Museum of the Asian-African Conference (MKAA), Asia Afrika 65, Bandung (West Java) 40111. Map. Koha, Collective Access, and Zimbra Mail Server workshops. Contact: Andi Sugandi, Alam Aby Bashit, and Rizki Izandi Gumay. Agenda: Casual party, where every attendee can be free to talk about anything related openSUSE. How to attend: Please add your name here (Japanese) to register for the party. 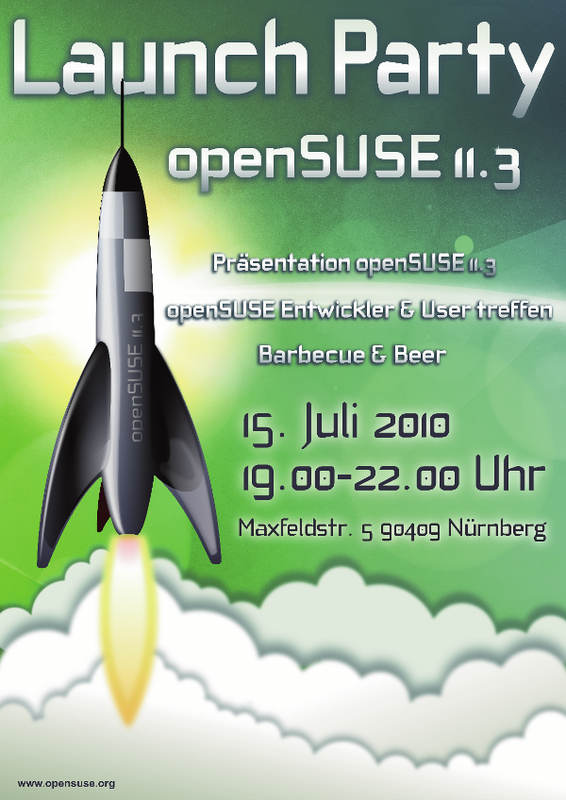 Join the openSUSE Boosters, openSUSE developers and users for a presentation of the new openSUSE 11.3 combined with some beer and barbecue! 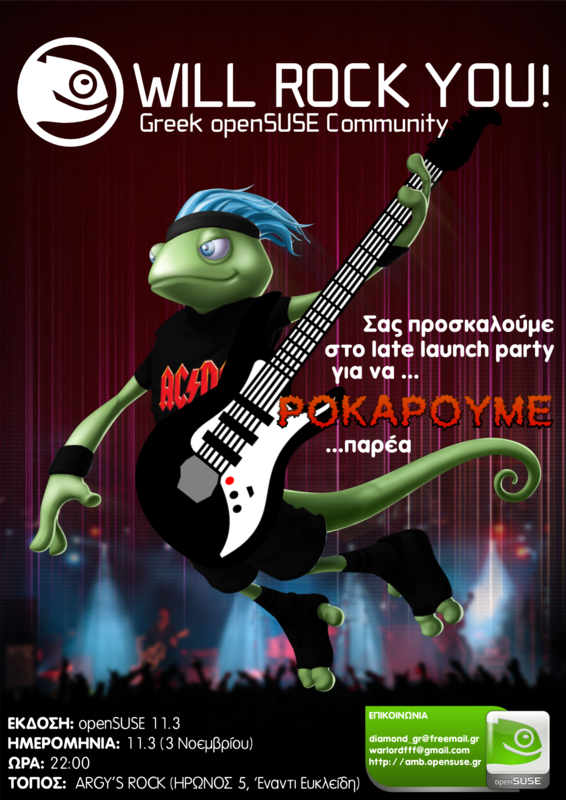 MOTO: openSUSE Rocks, come to rock it together. Contact: Emails are on the poster. What: Launch Party, Beer & Pizza. Where: GnuOwned's Apartment: Av. Universidad 1953 edif 16 depto 301, Col. Copilco-Universidad. Contact: @gnuowned (Mike Barajas) at twitter. Miguel Barajas GnuOwned on FaceBookor mabarajas at novell dot com. Where : Academia del Software Libre - FUNDACITE, Mérida Venezuela. More info in the Facebook Event page. Please, for more details send a PING to Silvio Palmieri. Where: Administrative Center Antonio Fanchin Filho (Gralha Azul) Rua XV de Novembro Nº 195 - up here. Please, for more details send a PING to Carlos Ribeiro. Where: Carlos Ribeiro Apartment - Praia Grande - up here. Please, for more details send a PING to Paulo Sá. Please, for more details send a PING to Thiago Laurito. For more details contact Diego Ihara or Eliseo Ocampos. 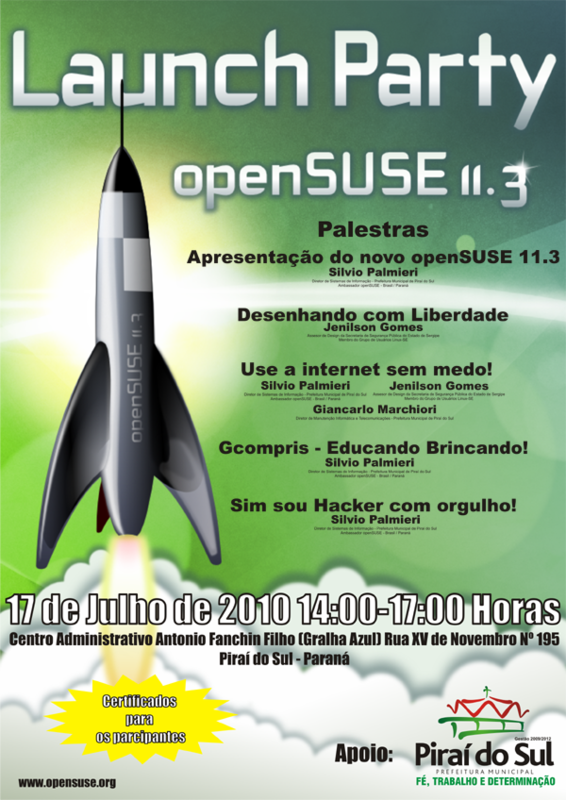 When: August 7th 16:00 - 19:00 h.
When: August 7th 19:00 - 21:00 h.
What: Launch Party openSuSE 11.3 and KDE 4.5, Food & Drinks. Where: USAC: Ciudad Universitaria Z.12 Ed. Recursos Educativos Level 4. Contact: @konelix (Axel Ruiz) at identi.ca. or konelix at opensuse dot org dot gt. Please, for more details send a PING to Agustin Chavarria. 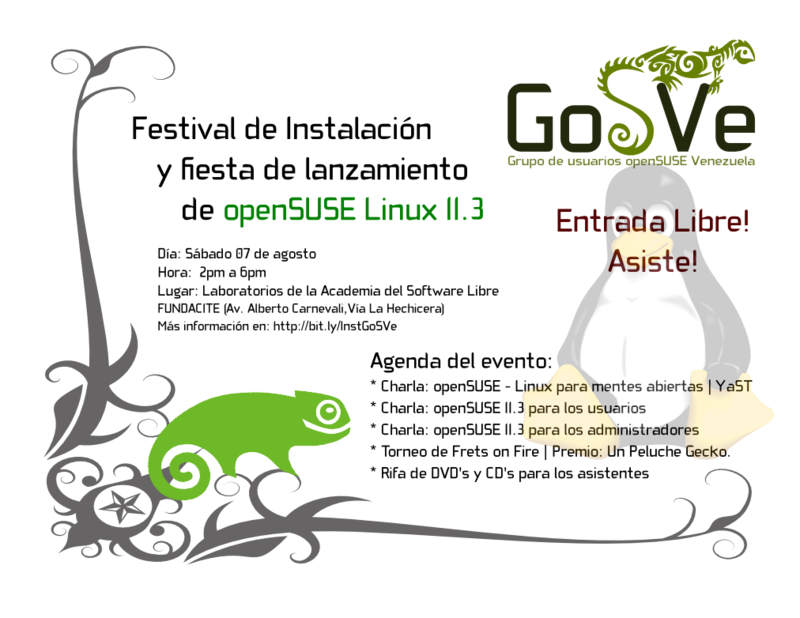 What: "openSUSE 11.3 Release Launch Party"
This page was last modified on 30 November 2010, at 12:55.